3.8 / 5 Score from 6 reviews. - 25% Early booking discount! 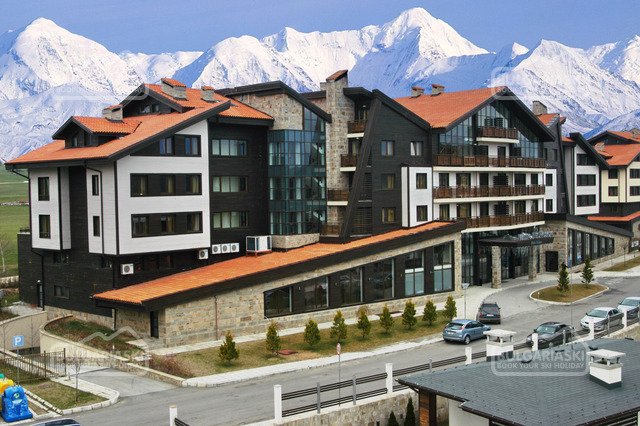 Location: MPM Hotel Guinness is situated in a quiet area about 200 m from the Gondola ski lift in Bansko resort at the foot of the Pirin mountain. Accommodation: MPM Hotel Guinness offers fully furnished 38 studios, 41 small apartments, 13 large apartments and 27 maisonettes. The guestrooms offer digital TV, telephone, Internet, equipped kitchenette and bathroom with a bath-tub, a hairdryer and a phone. 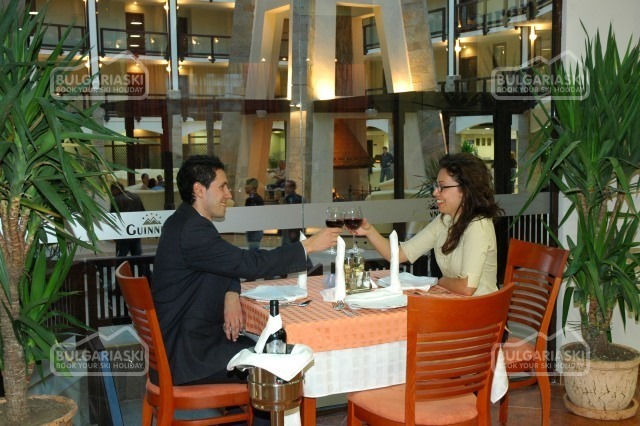 Wine & Dine: Atrium lobby, main restaurant with 200 seats and mehana (a tavern in Bulgaria style) with 80 seats are at guests' disposal. They offer Bulgarian and European cuisine, pizza, a variety of drinks, as well as Bulgarian folklore music. 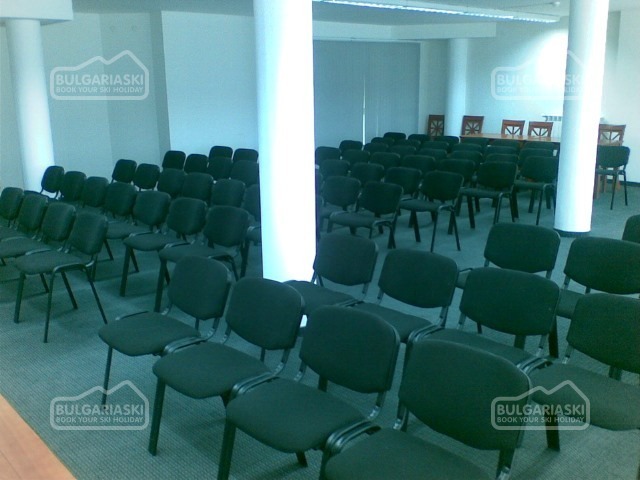 Conference facilities: For conferences and business events there is a conference hall for100 people. The necessarily equipment is provided. Spa centre: The spa centre features heated swimming pool, massage room, steam bath, sauna and a variety of spa procedures. Facilities: The parking is free of charge for the hotel's guests, whereas the garage is subject to an extra charge. Free Wi-Fi internet access is available in the public areas. There are such entertainments as billiard, game hall and table tennis. We visited Guinness Hotel on January 2009 and it was an exciting experience. The Hotel is very good and the staff very friendly. 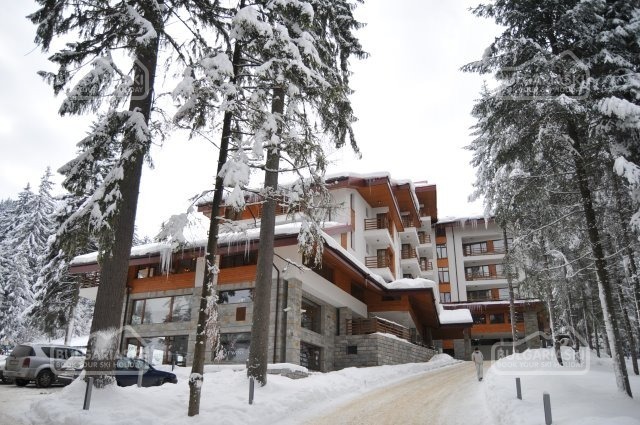 The Hotel is situated very close to the lifts, so it’s no need to use the car, although the Hotel provides a mini bus shuttle service from the Hotel to ski lifts. The rooms are excellent, very clean and with a lot of space. Guinness Hotel is an excellent choice for families like us (2 children) and that’s the reason we have already booked again a 4 nights accommodation, in the same Hotel, for Christmas vacation. After having spent a week in the Guinness and as our second visit to Bansko skiing, we were thoroughly impressed by the unique and impressive accommodation that the Hotel offers. We were really fortunate and got a 1 bed appartment which gave the pair of us loads of room to relax. The rooms were very warm but we soon organised the radiators to suit our needs and it was great to have such amazing cleaners keeping the rooms absolutely pristine! If there was a criticism to the whole thing, I would have to say that the breakfast room was FREEZING... and the food for breakfast and evening meal (apart from the delicious Greek Salads and chicken soup) was rather bland - the menu offerings were rather lost in translation - I must however state that the staff's English was much better than my Bulgarian so I don't want to be too critical here. We love what Bansko has to offer by way of the boarding facilities and would really consider coming back to The Guinness. Having read many reports from other people who have stayed in Bansko, there are criticisms of the "building site" that the town offers. This is fair as there is a massive amount of development being undertaken but for what we were looking for, Guinness and Bansko is perfect! I stayed last February and was very impressed with the ambiance and the cuisine. I would recommend to anybody wanting a quality holiday particularly skiers/Snowboarders as the Gondola is only a short walk away. 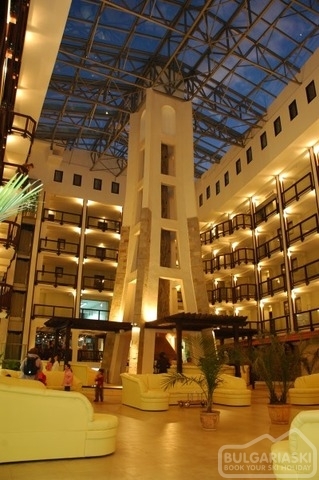 Please, post a comment on Guinness Hotel in Bansko. * The rates are in Euro per room/apartment per night with breakfast and dinner included (menu or buffet), use of indoor swimming pool, sauna, steam bath, ski depot for own equipment, WiFi at the reception area, open-air parking space, free shuttle to the bottom station of the Gondola Lift included in the price. * Cancellations can be made, providing details of this are received at least 10 working days prior to check-in day for arrivals in Low or Promo seasons, 21 working days for arrivals in the period 05.01 - 11.01.2019 and 31 days for the period 28.12.2018 - 04.01.2019. Cancellations made after this period will incur a fee equivalent to the cost of the 3 night's accommodation and catering! Cancellations for arrivals in the period 28.12.2018 - 11.01.2019 will incur a fee equivalent to full amount for the accommodation! Garage - 8 Euro per day. For reservations on board HB (halfboard base) on 31.12.2018 will be provided only New Year's Eve Dinner. For future visits I would stay on a bed and breakfast basis as the options to eat out in Bansko are varied and reasonably priced. Tea/Coffee making facilities are an essential in any hotel - they were not available at the Hotel Guiness.